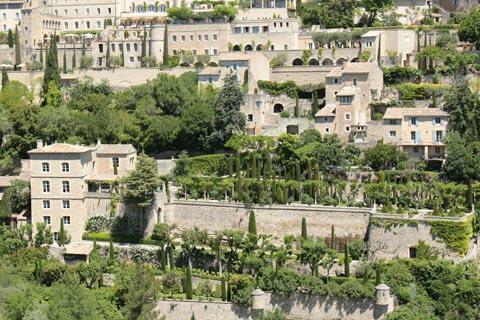 Gordes, listed among the 'most beautiful villages in France' and one of the perched villages of Provence is 38 kilometres east of Avignon and built on the slopes of a large rock in the very scenic Luberon area of Provence. 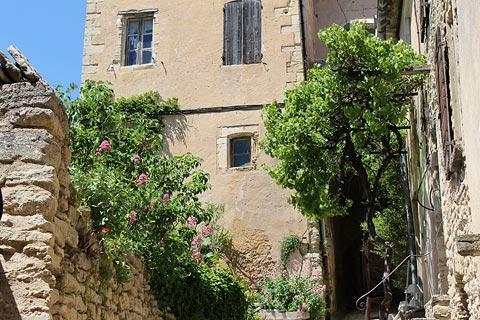 Gordes is a lovely traditional Provencal village with narrow cobbled streets that wind ever higher through the tall, ancient houses to the church and castle that stand above the village, with views across the Luberon mountains and region. 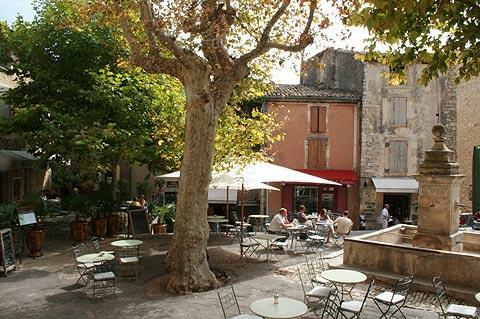 It is also the most visited of the villages in Luberon so you won't often find yourself in quiet solitude! 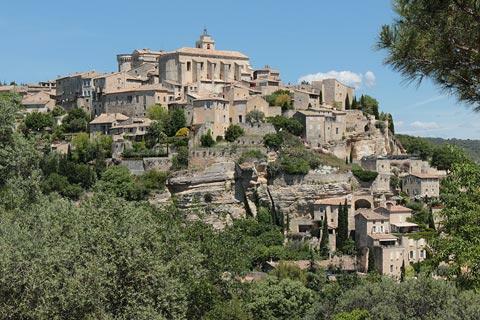 Before you start exploring the village centre, we should mention that an important part of the attraction of Gordes is the view of the village when it is seen from across the valley to the west with the whole village in terraces down the slope of the hill, with Italian poplar trees and other plants breaking the whiteness of the village. 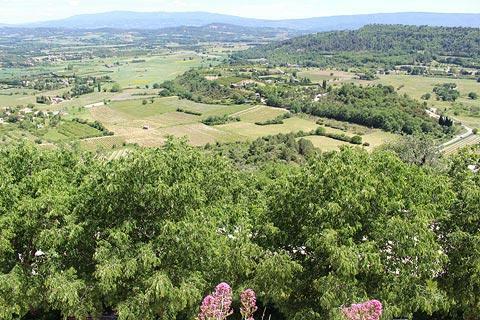 Start your visit with a walk along the road towards Cavaillon / Avignon until you have enjoyed the view: you need to walk several hundred metres to see the best views but it is well worth it. 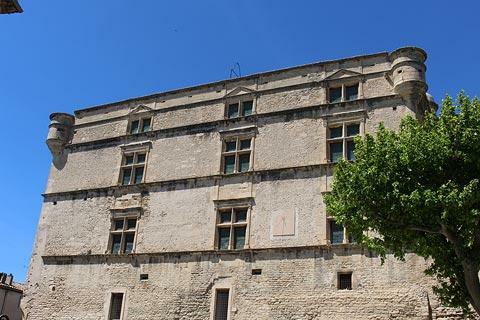 Returning to the centre of Gordes, the first monument you see is the castle: the most important historical monument in the village and also now carefully restored, the castle was originally built in 1031 (or earlier, its exact origins are unknown) and then rebuilt in 1525. 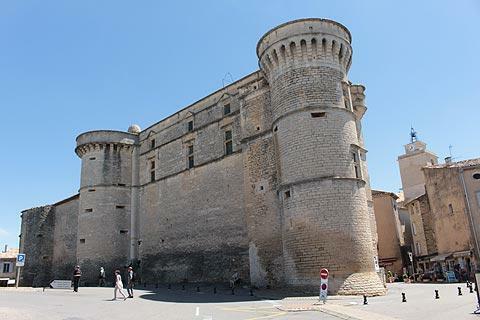 It is now an imposing monument with its high stone walls and round towers, combining medieval and renaissance architectural features. 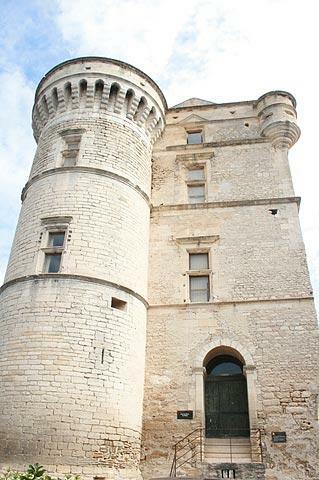 The Tourist Office for Gordes and temporary art exhibitions are based inside the castle. Ask for a map of the village in the tourist office while you are here or you will not discover all the little highlights hidden in the alleys of the village. Next to the castle in Place Genty Pantaly you can see a square fountain, not remarkable in itself perhaps, but until 1956 this was the only source of drinking water in the village! 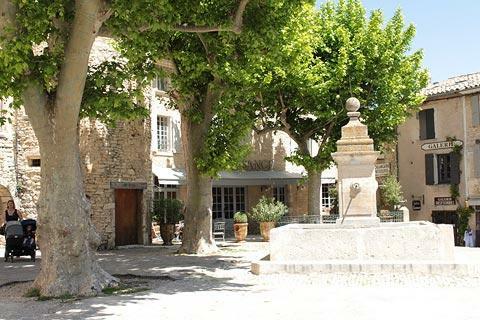 This square is quite open now but in medieval times was surrounded by walls and the centre of the historic village. Follow the small lane out of the bottom of the Place Genty Pantaly to see the Church of Saint-Firmin, and almost next door, the entrance to the Chaplaincy of Saint-Jacques (a wooden door in a stone doorway, not much to see). 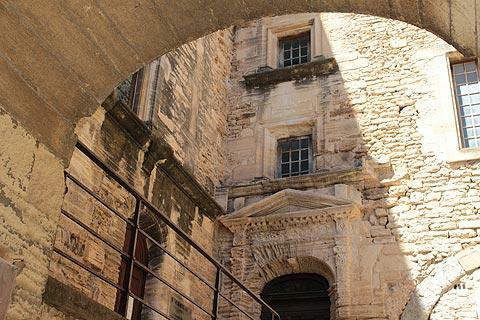 The arch next to the chaplaincy is called the Porte de Savoie and was one of the original entrances into Gordes through the defensive ramparts. 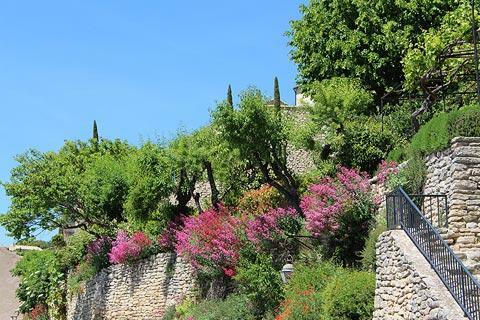 From here you can follow signs around to the Theatre des Terrasses which has a lovely view towards the south, then follow the road back up the hill into the village centre. 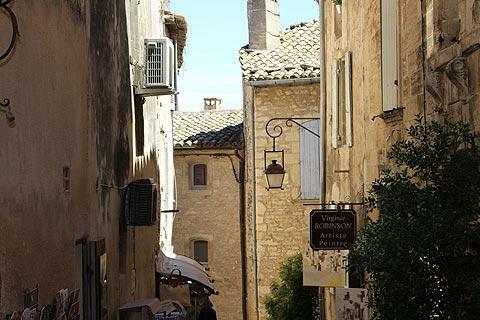 If you are full of energy you can follow a longer loop that goes down the hill from the viewpoint then turns right to follow the roads (Rue Pavé d'Amour, Rue Fontaine Basse, Rue Jean Deyrolle) in the lower part of the village to see lots of pretty stone houses and gardens. France This Way comment: the village itself, while very attractive, perhaps fails to live up to the high expectations that the view as you approach has prepared you for. 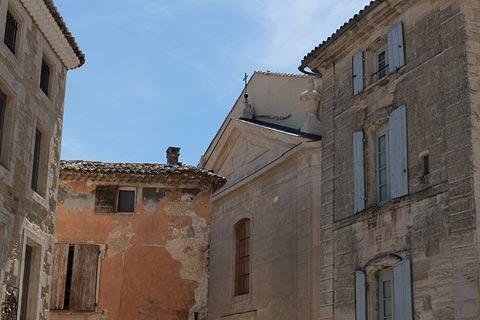 In some respects Gordes is not so evocative to explore as some of the others in the region such as Roussillon or Lacoste - but a visit is still highly recommended! 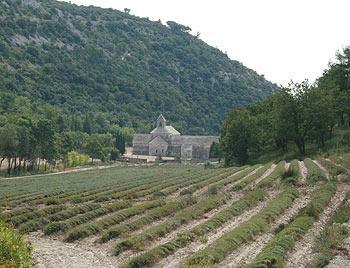 Abbaye de Sénanque is a beautiful 12th century abbey in the valley near Gordes (and still has resident monks). 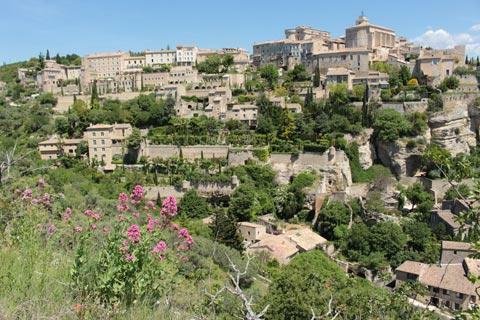 After following the road the few kilometres from Gordes to the abbey, be sure to find time to carry on a few more kilometres along the same road - it is one of the most scenic roads in the region, as it winds its way through the craggy hills of the petit Luberon: see Abbey of Senanque. 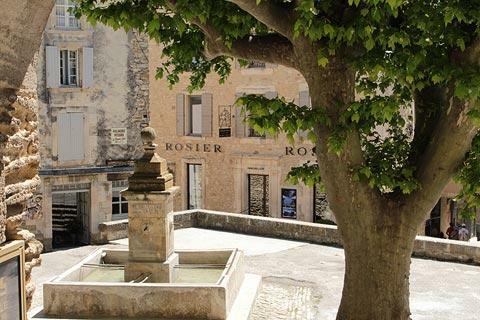 Village of the Bories. 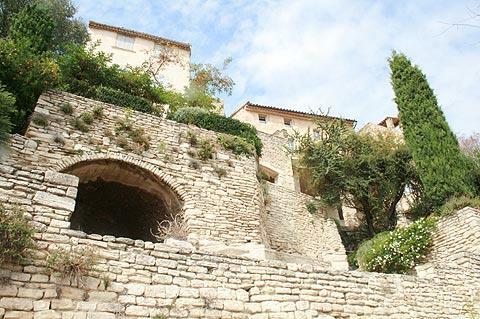 Sitting on the edge of the Vaucluse mountains, the bories are ancient stone dwellings, dating back up to 3000 years. 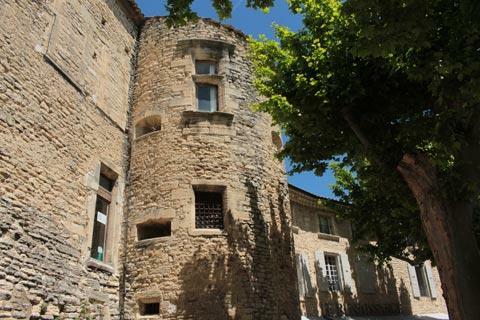 The Village of the Bories is now classified as a National Monument, and is a fine example of such a village, with numerous buildings, sheep-pens, bread ovens etc to explore: see Village des Bories. 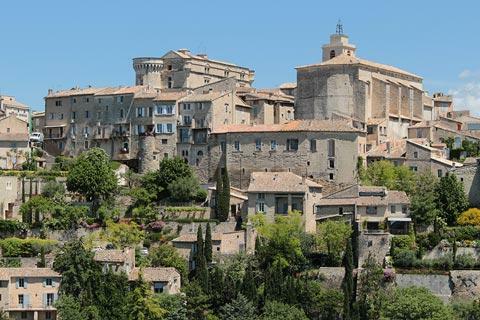 Other places popular with visitors include a visit to the oil mill outside Gordes on the road towards Cavaillon, which combines a visit to a historic oil mill with an exhibition of glass such as window panes and stained-glass windows from across the centuries; and a Lavender museum at Coustellet where you can learn about all the steps in the processing of lavender, from harvest to the production of lavender oil. 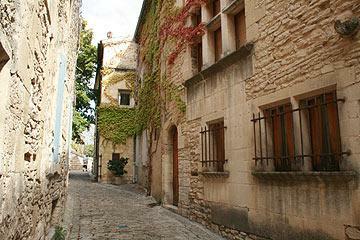 See also our Luberon travel guide for lots more scenic villages close to Gordes.